To date, GoMAMN has been successful in creating a forum by which stakeholders can coordinate and integrate monitoring efforts based around the core values identified through the SDM process and articulated in the fundamental objectives and associated performance metrics. Additionally, members of the Network have identified and agreed upon a suite of priority birds to guide conservation and monitoring efforts, as well as agreed to a habitat classification schema to facilitate communication and coordination. However, the long-term maintenance, stability, and success of such a forum will hinge largely on the Networks ability to translate the core values into tangible monitoring strategies that address contemporary and future needs through cost-efficient, scientifically rigorous, and standardized surveys, data management and data reporting; that yields timely information for decision makers. To address these longer-term issues, the taxa-based working groups with input from the larger Community of Practice are using the objective hierarchy and associated performance metrics to identify key management actions and ecological processes presumed to impact avian populations. 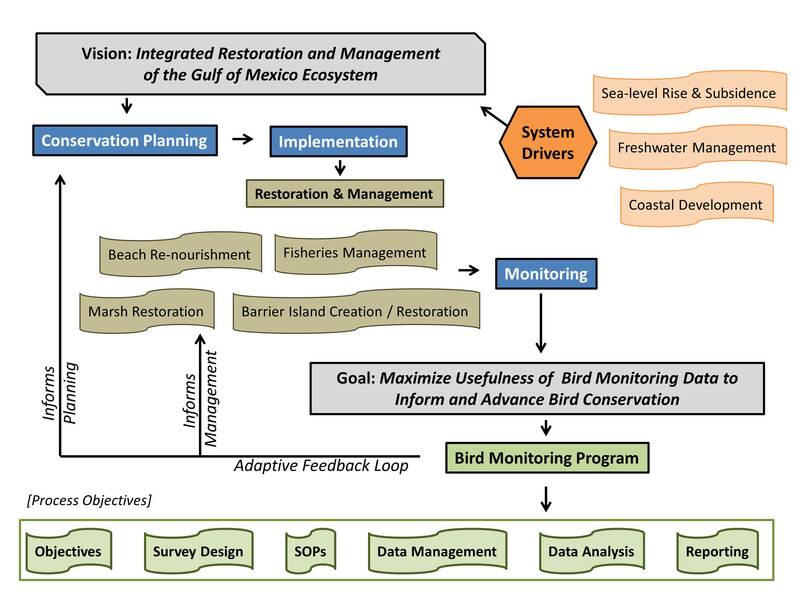 To facilitate this effort, each taxa-based working group is constructing a suite of influence diagrams (i.e., graphical representation of conceptual models) that depict how key management actions and disturbance mechanisms (presumably) impact priority bird species in the northern Gulf of Mexico. Each of these influence diagrams is supported by a compilation of information that documents the management and/or ecological process, the degree of uncertainty associated with the presumed impact to avian populations and the magnitude of presumed impact to avian populations. 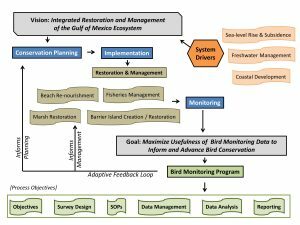 Collectively, the information contained within the influence diagrams, used in concert with the performance metrics articulated in the objective hierarchy will be used to identify Gulf-wide monitoring priorities and needs for all priority birds and their habitats. Examples of increased coordination and integration towards priority data needs and acceptance of the core values are already emerging as partners collaborate to implement monitoring activities focused on the evaluation of restoration projects, as well as to design and implement new surveys to advance decision making and bird conservation efforts. Utilizing the above referenced products and tools, members of the Network are currently working to draft a Strategic Avian Monitoring Plan for the northern Gulf of Mexico that documents and articulates the core values, species-specific monitoring needs and recommendations for implementing avian surveys, data management and data reporting. It is anticipated that through the development and vetting of a Gulf-wide Strategic Avian Monitoring Plan, a concrete foundation will be built to further enhance coordination and collaboration across a large community of practice, stakeholders, partners and decision makers that ultimately results in the establishment of a formally recognized and funded bird monitoring program to coordinate: surveys, data collection, data management and data reporting to maximize the utility of data to inform avian conservation across the northern Gulf of Mexico in an adaptive manner. To learn more and/or to get engaged, use the Contact Us link or reach out directly to a member of the Coordination Committee or one of the working groups. Conceptual model depicting the role of a Bird Monitoring Program to maximize the usefulness of data to inform conservation actions in an adaptive manner.